Priscilla Coleman has been drawing court scenes for over 20 years. The pictures collected in her book mark many of the most important trials such as Rose West, Ian Huntley, Harold Shipman, the Guinness trial and the Hutton enquiry. There is a widespread misunderstanding among those who see pictures on TV or in the newspapers that an artist can sketch as much as they like in court. As lawyers know, far from taking a palate and easel into the public gallery, any attempt at photography, drawings or visual representations is strictly verboten. Artists have to memorise in court the colours, shades, clothing, facial mannerisms and physical idiosyncrasies then go out and draw a likeness from memory . . . against the clock. 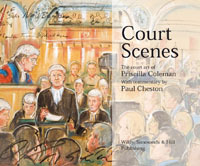 "Court Scenes: The Court Art of Priscilla Coleman"
published by: Wildy & Son’s ltd.